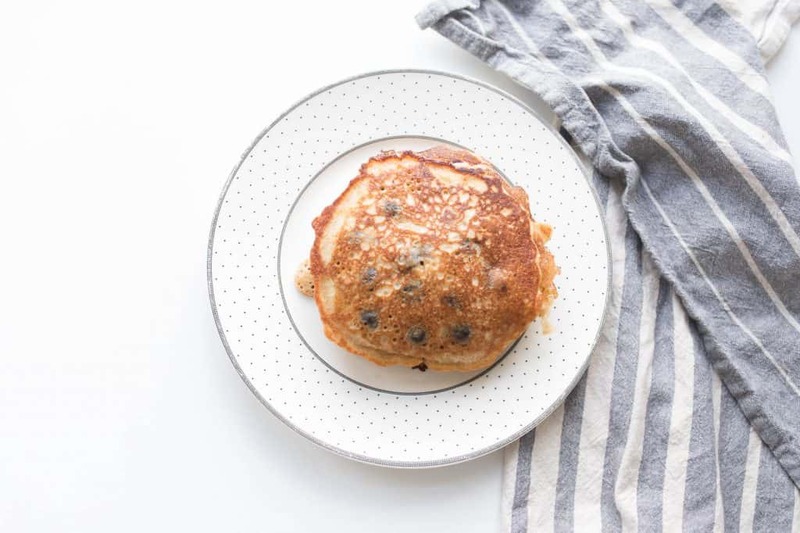 Our favorite sourdough pancakes recipe is simple to whip up with just a few basic ingredients. 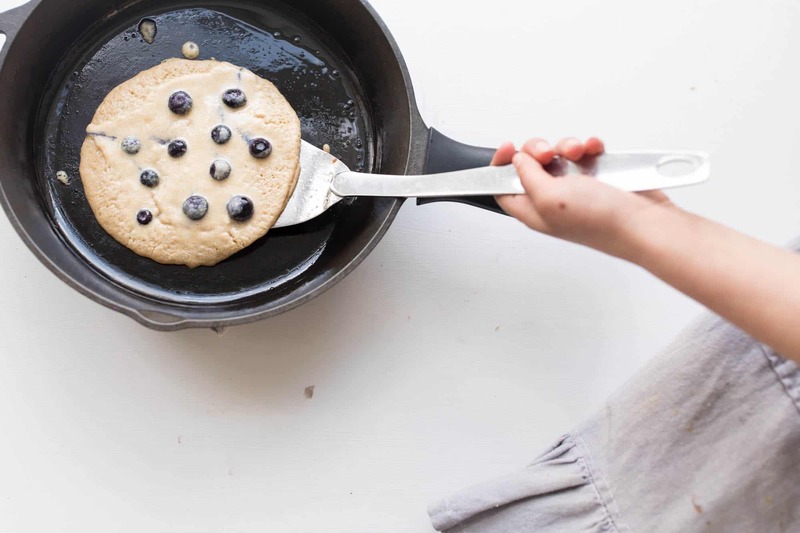 Add toppings, like blueberries or chocolate chips to make them an extra special weekend morning treat. If you have been hanging around the old farmhouse a while, you know how I loooove my sourdough starter. I have been nurturing it for over six years now. I use it to make English muffins, pizza crusts, sourdough skillets (recipe coming soon), even doughnuts! But, you know what I make with it more than anything else? Pancakes. 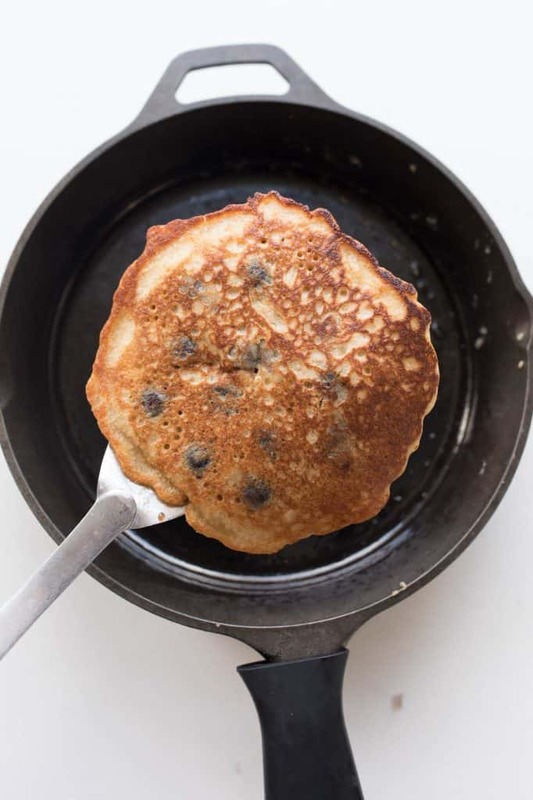 Deliciously fermented, fluffy, crisp around the edges, sourdough pancakes. “If that’s so, why pray tell has it taken you so dang long to post the recipe? ?”, you might ask. I must admit, I have no excuse. I just never got around to it. Several people on Youtube and Instagram asked me about my pancake recipe. Your promptings finally kicked me into gear. So, here it finally is my friends. Our sourdough pancake recipe. The one I have made every Saturday morning for probably like six years now. 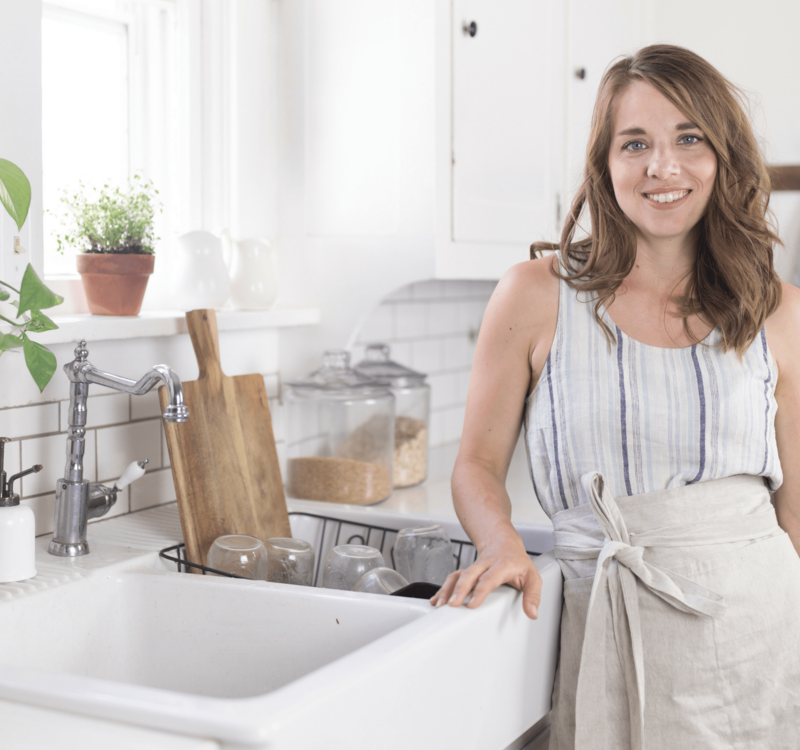 Now, if you have been making recipes with sourdough starter, you may know that usually there is a waiting time to allow for fermentation, like in my sourdough English muffin recipe. But, the wonderful thing about this recipe is there is no wait. You just need to have two cups of fed starter on hand. It doesn’t even have to be room temperature. You can pull your glass bowl of starter out of the fridge, and as long as there is at least two cups of starter, you are good to go! Now, this is of course assuming that you fed your starter and allowed it to ferment a little before you put it away last time. If you just stirred the flour and water in, and popped it into the fridge straightaway, it will need a little fermenting time. And if this is all a bunch of jibberish, make sure to visit my post on all the benefits, how to, and why do (just made that up) of sourdough, in this post. Although it certainly isn’t a requirement for sourdough pancake makin’, I prefer using cast iron. If you are brand new to cast iron cooking visit this post all about it. To ensure the cakes don’t stick, you will need to follow two rules. Preheat the skillet before letting the batter hit it. Only flip the pancake one time. I like my sourdough pancakes to have that crispy fried edge. To do this, I start by preheating a tablespoon of coconut oil in my skillet. After it is hot enough o produce a sizzle, I pour a ladle full of batter right onto the hot oil. At this point, I turn the stove down a bit so that the pancake has a chance to cook through without the bottom burning. Remember that “flip only one time” rule. After the top is nice and bubbly, give it a little flip. Allow it to cook another 30 seconds on the other side. 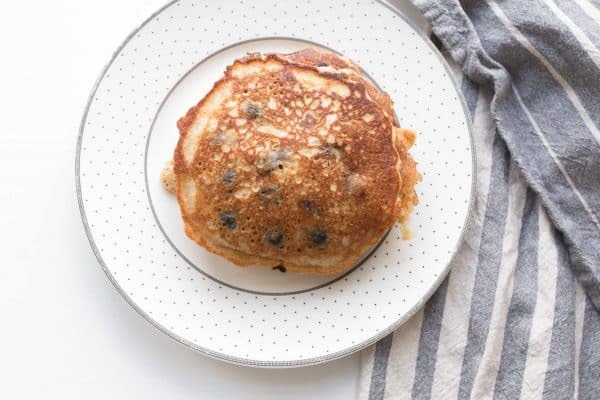 If we plan to add blueberries and chocolate chips, we like to put them on the uncooked side while the cakes are cooking. I find that if the chocolate actually makes contact with the skillet, they tend to stick. This is why I don’t stir them into the batter. Same goes for blueberries. 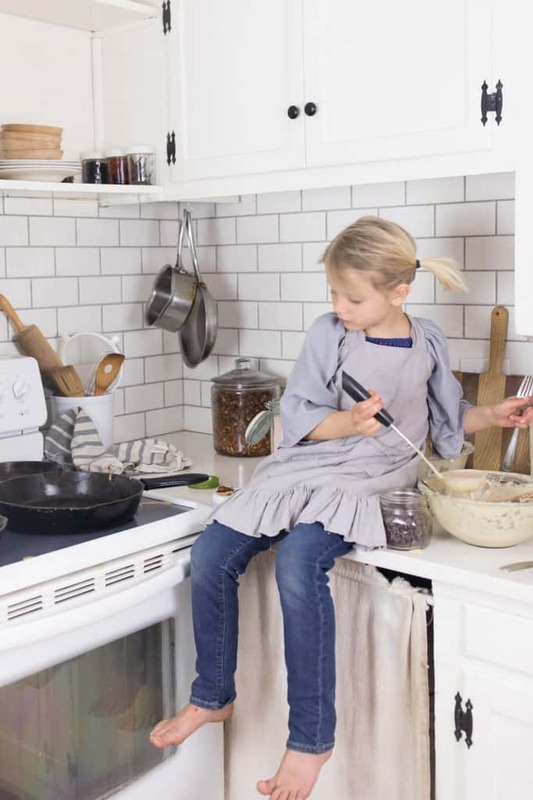 This little barefoot girl is my official kitchen helper. When I am through most of the batter, she likes to use the rest to make little pancakes for her dolls. We usually have to double this recipe for our family of seven. Enjoy this recipe. You haven’t lived until you’ve tried sourdough. Stay tuned for our sourdough skillet recipe and video. Fluffy, fermented sourdough pancakes are simple to make with six basic ingredients. They are a great weekend morning treat. I like my sourdough pancakes to have that crispy fried edge. To do this, I start by preheating a tablespoon of coconut oil in my skillet. After it is hot enough o produce a sizzle, I pour a ladle full of batter right onto the hot oil. At this point, I turn the stove down a bit so that the pancake has a chance to cook through without the bottom burning. Remember that "flip only one time" rule. After the top is nice and bubbly, give it a little flip. Allow it to cook another 30 seconds on the other side. If we plan to add blueberries and chocolate chips, we like to put them on the uncooked side while the cakes are cooking. I find that if the chocolate actually makes contact with the skillet, they tend to stick. This is why I don't stir them into the batter. Same goes for blueberries. Please do your weekly grocery haul and morning/evening routine videos. Just made these yummy pancakes for my husband’s birthday breakfast yesterday. My middle daughter was so proud because she had spent the week making our first sourdough starter with the directions from your blog. I love watching your videos – they have a calming and therapeutic effect. Nicely done! Oh my gosh, you were making me nervous cooking around a hot stove and sizzling oil with a baby sticking right out in front with his little legs and everything!! I started a “starter” about 7 days ago and am making your pancakes now. But my starter is very thick. It’s almost a “pasty” consistency. They taste great but am I doing the starter right? The one cup flour to 1/2 cup water seemed to make my dough sticky. Thanks for any advice. I purchased my starter from a lady in Oregon at a Farm Market. She instructed me to use 1/2 cup of warm water to 3/4 cup of flour to feed my starter. However, I made my pancakes this morning and though they were quite yummy, they were very thin because my batter is thin. My starter is thinner than Lisa’s. I’m going to try the 1/2 cup to the 1 cup and see if I can get a thicker consistency. It’s supposed to be very sticky, so don’t worry about it. Better to be thicker than thinner…based on my limited experience. These are the very best pancakes! Not very sweet, light and fluffy, and so so easy! Thank you so much for the recipe! My starter was ready a few days ago and last night we had the sourdough pancakes and they were fantastic! In fact I think they were the best pancakes I have ever had. Do you have a video on making sour dough bread? I am going to try the pizza crust and the English muffins next week. Thank you Lisa, you have definitely inspired me! Just made these amazing pancakes and they were so delicious! Thank you for sharing. I love your channel and your blog. I so appreciate your methodology and simplistic approach! A note about the sour dough starter. I tried doing it with regular all purpose flour and it was pastie and gloppy. I then tried the following week with organic all purpose flour and it turned out amazing! I’m going to try the English muffin recipe for Easter breakfast! ? Decided to try your recipe today since I usually use a recipe from Cultures for Health, but I wasn’t happy with the way the last batch turned out. (I am using a San Francisco starter fed with 100% fresh ground einkorn berries.) These pancakes turned out awesome! So fluffy and light! So glad I decided to venture out and try your recipe. You have never disappointed! I’ve made this twice now and they are SO good! Thank you for the recipe. I have, however, screwed up my sourdough starter I think. I used two cups of my starter after it was done on day 7 and it used most of it, but there was maybe 1/4 or 1/2 cup left. I put it in the fridge and when I took it out and fed it, I’m having trouble getting it to double and bubble. What should I do next and where do you think I went wrong? Hi Hope! How long did you leave it out after feeding it? It needs a good eight hours to get bubbly again. How long did you leave it out after that? I bet it will still bubble up, but it just might take a little longer since there was so little left. It should do it though! Today was Day 7 for my sourdough starter. I’ve been patiently waiting to use your pancake recipe. Made them this morning. They were the best pancakes I’ve ever had. Thanks for sharing! Happy Thanksgiving to you and your family ? Very good. Batter was thinner than I was used to but easy to flip. Added chocolate chips. I used a white whole wheat starter. My kids loved them. Delicious and thank you for my very first successful sourdough pancake recipe! I just tried my first batch of sourdough pancakes with starter I began 5 days ago. Delicious!! I am wondering if you use refined or unrefined coconut oil in your recipes? I’ve been using this recipie and love it. I want to try it as a waffle batter too but am worried it’s a little watery, If you have any suggestions let me know!! Just made these and they are perfection! I added some mashed banana and luv the crispy edges too. Thank you!